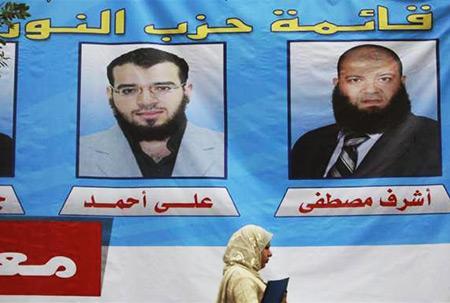 According to Egypt's elections committee, the Muslim Brotherhood won 37 percent of the vote of the first round of voting in Egypt; and the Salafis, who promote a yet more extreme Islamist program, won 24 percent, giving them together a jaw-dropping 61 percent of the vote. The Muslim Brotherhood (founded in 1928) and the military dictatorship (ruling Egypt since 1952) have a parallel ideology and a long history that makes them simultaneously rivals and allies. Over the decades, they off-and-on cooperated in an autocratic system bound by Islamic law (Shari'a) and in oppressing liberal, secular elements. In this spirit, Anwar El-Sadat, Hosni Mubarak, and now Mohamed Tantawi tactically empowered Islamists as a foil to gain Western support, arms, and money. For example, when George W. Bush pressured Mubarak to permit more political participation, the latter responded by having 88 Muslim Brotherhood members elected to parliament, thereby warning Washington that democracy = an Islamist takeover. The apparent weakness of non-Islamists scared the West from further insisting on a transition to political participation. But a close look at the 2005 elections finds that the regime helped the Islamists gain its 20 percent of the seats. 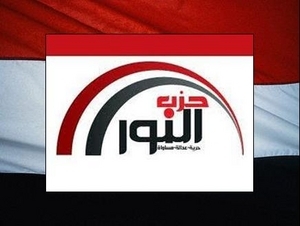 The logo for the leading Salafi party, An-Nur. 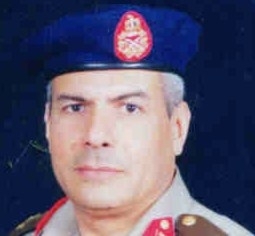 Today, Tantawi and his Supreme Council of the Armed Forces (SCAF) still play this tired old game. Note the various methods: (1) Reports of electoral fraud have emerged, for example in Helwan. (2) SCAF has, according to the prominent Islamist Safwat Hijazi, offered a "deal" to the Islamists: it shares power with them on condition that they turn a blind eye to its corruption. (3) The military has subsidized both the Muslim Brotherhood and Salafi political parties during the recent parliamentary elections. Marc Ginsburg reports on a SCAF slush fund totaling millions of dollars in "the form of 'walk around' money, clothing and food giveaways" that enabled hundreds of local chapters of Islamist political organizations to buy votes. Ginsburg tells of a SCAF emissary who "met secretly with representatives of the Muslim Brotherhood and other Islamist oriented political movements last April to establish local political 'action committee' bank accounts to funnel an underground supply chain of financial and commodity support." Salafis won nearly one-fourth of the votes? Something fishy here. Dominate Egypt? If the military colludes with Islamists to remain in power, obviously it, and not Islamists retains ultimate control. This is the key point that conventional analysts miss: the recent election results allow the military to keep power. As aspiring Egyptian politician Mohamed ElBaradei correctly notes, "it is all in the hands of SCAF right now." True, if Islamists control the parliament (not a sure thing; the military could yet decide to reduce their percentage in future rounds of an unusually complex voting procedure open to abuse), they acquire certain privileges and move the country further toward the Shari'a – as far, anyway, as SCAF permits. This maintains the long-term trend of Islamization underway since the military seized power in 1952. Second, instantly cease all economic aid to Cairo. It is unacceptable that Western taxpayers pay, even indirectly, for Islamizing Egypt. Resume funding only when the government allows secular Muslims, liberals, and Copts, among others, freely to express and organize themselves. Mr. Pipes (www.DanielPipes.org) is president of the Middle East Forum and Taube fellow at the Hoover Institution. Ms Farahat is an Egyptian activist and co-author of a book about the Tahrir Square protests. 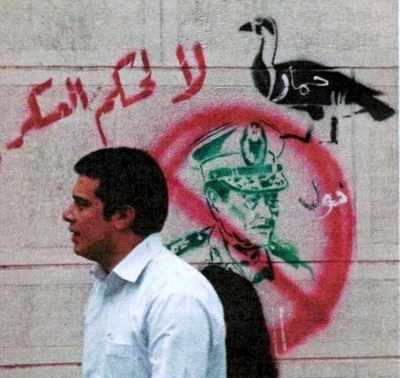 A man walks by a graffito that proclaims "No to military rule," crosses out a picture of military dictator Mohamed at-Tantawi and calls him a "fag." Dec. 6, 2011 addendum: The text above refers to the USSR but Russia held elections two days ago that the U.S. secretary of state denounced for their "electoral fraud and manipulation." At least they don't insult everyone's intelligence with 99-percent results. Dec. 7, 2011 update: It did not take long for the Supreme Council of the Armed Forces to confirm the analysis above, reports David D. Kirkpatrick in "Military Flexes Its Muscles as Islamists Gain in Egypt." Egypt's military rulers said Wednesday that they would control the process of writing a constitution and maintain authority over the interim government to check the power of Islamists who have taken a commanding lead in parliamentary elections. In an unusual briefing evidently aimed at Washington, Gen. Mukhtar al-Mulla of the ruling council asserted that the initial results of elections for the People's Assembly do not represent the full Egyptian public, in part because well-organized factions of Islamists were dominating the voting. The comments, to foreign reporters and not the Egyptian public, may have been intended to persuade Washington to back off its call for civilian rule. "So whatever the majority in the People's Assembly, they are very welcome, because they won't have the ability to impose anything that the people don't want," General Mulla said, explaining that the makeup of Parliament will not matter because it will not have power over the constitution. General Mulla … insisted that he respected the fairness and integrity of the election, which began in November and will continue in stages until January. But, he said, "In such unstable conditions, the Parliament is not representing all the Egyptians." … General Mulla insisted that the prime minister would continue to report to the military council. Asked if the military would eventually submit to public parliamentary oversight of its budget, General Mulla appeared to find the idea ridiculous, saying he knew of no military whose budget was public. Asked if the military might intervene in civilian politics in the future, however, he was more circumspect. "The armed forces won't intervene in the political life of Egypt since the people will consent in the parliamentary bodies," he said. After the adoption of new government institutions, he said, "there will be no need to intervene." The illogic and contradiction of this presentation point to SCAF's gamesmanship. 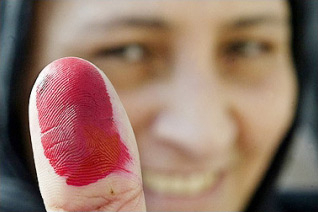 Jan. 24, 2012 update: Cynthia Farahat and I take a look at the second round of parliamentary voting (and are no more impressed by it) at "Don't Ignore Electoral Fraud in Egypt."